I had the honor of being interviewed by Dr. Reed Tuckson on his new podcast show, “Dr. Reed Decided to Live 120 Years”. I had not known Dr. Reed previously, so I was surprised to discover that he is such an incredibly lovely and warm-hearted person! Our short 40 min talk was truly joyful for me. As the conversation went on, I could really feel his spirit, his passion and his light flowing from his being and it made my own heart come alive. So, I thought I’d share the interview here! I am so grateful to all the beautiful souls across the Earth who are sharing their love and light in so many ways! I hope that you enjoy Dr. Reed as much as I have, and if you’d like to see more of his podcasts you can continue to check them out on braineducationtv.com! Today I took the best bath ever! In this most comfortable setting, I contemplated about choosing, story-making, victim consciousness and master consciousness. I realized that the reason why story-making is a problem, is that we always do it from our victimized consciousness. We always make stories that hurt us and turn us into victims, creating enemies and a lot of blaming, judging, complaining mind. Inside of this mind set, we get ever darker and more negative…heavy…miserable. However! What if we could just turn it around and instead of declaring story-making as a bad thing, we could just use it as a tool from our master consciousness? A story that heals us and empowers us is a like medicine for our brain. If that story helps us to produce positive, happy hormones, then what a great story it is! Since we are the creators of our lives, we are the ones who get to choose it as our new truth, replacing the old poisonous story. Isn’t this basically what positive affirmations are? In the “I’ve Decided to Live 120 years Book,” Ilchi Lee talks about becoming the ‘victimizer’. Basically, he says that when you feel like a victim you can never solve anything. You can never change the condition of your brain and your stuck in a negative circumstance, wanting/needing somebody or something outside of you to change in order for you to feel better. He says that the only way out of this is to somehow make yourself the ‘victimizer,’ and then at least you can change yourself. You take your power back. This is my most productive bath contemplation to date. Liberating your brain from old negative perspectives and stories is worth more than $1000! If you have a chance to try the above exercise and really allow yourself to own everything in your life that you otherwise thought you were a victim of, I’d love to hear how it goes! And if you have a chance to take a cozy enlightening bath ~ I highly recommend it! Today I want to give a shout out for BETV, a new youtube channel featuring Brain Education! For those who don’t know, Brain Education is the essence of Body & Brain Yoga and Tai Chi. It is the practice which I have been training in, teaching others and sharing to all of you for the last 19 years. In fact, I joined the Body & Brain center myself back in Waltham, Massachusetts in January 2000, so I am literally celebrating my 19th year anniversary this month! That’s why it’s not an exaggeration to say that I have dedicated nearly half of my life so far to this amazing training method. Well, Brain Education is rich with energy exercises and universal principles that guide us back to who we truly are. It has been incredibly healing and indescribably beautiful for me to meet with that original nature. It has opened my eyes to new perspectives and brought me to expanded levels of consciousness. Brain Education is about discovering your greatness through becoming the master of your body, brain and life. It has been liberating for me to realize that I am in fact the creator of my life, not the victim, and that there are concrete tools to help me navigate through the chaos of my mind as well as the world around me. Diligent practice has time and again brought me back to a reality that is not ONLY drenched in ego, negativity, selfishness and materialism. A reality where my soul can grow and my spirit can breathe, stretch and shine. I believe that this reality is where we are all meant to live. And this is just the tip of the ice berg. It’s nearly impossible for me to put it all down in words what Brain Education has done for me and hundreds of fellow practitioners that I have met along this path. This is why I’m so happy that it now has it’s own official youtube station! I look forward to seeing it reach a wider audience online, and pray that it will illuminate more lives with hope, as it has illuminated mine. One thing that I think is really neat about the station is that it will be hosted by Linda and Gabi, two young women who actually grew up doing Brain Education as children/teenagers. They both have mothers who are long-time practitioners, who introduced them at a young age. I think these bright lovely women have much to share and attest to as now-adults who were once BE Kids. I am very grateful that I had the opportunity to begin my day with deep training. I felt bright light entering my body and stretching out like twists of golden DNA through my arms and legs. I felt that energy was coming down to me from the center of the Universe, reminding me of who I truly am. In my heart, I felt a deep longing that such a light could be born onto this Earth. I was reminded that only the People of Light will create a World of Light. I am happy to be able to start off the year with such a pure message of light that stirred my soul. Following on the heels of a very up and down 2018, where I shrunk many times and many ways, it is so healing and hopeful to feel myself expanding. And I set a clear intention that 2019 will be a year of letting go, and loving big. I hope that you all set your intention for 2019 as well. Even if the details are yet to come, I encourage you to have a general focus for yourself this year, and watch how you and life bends to make that intention come into reality. The seven jewels of light in your body, your chakras, come alive. Delight arises from deep within your mind. Its energy spreads to your whole face, making it bright and cheerful. Your hands float, moving on their own as they do a dance of the soul. O people of light, you are beautiful! There is no reason to have a cheerful expression on your face. You’re not wearing a cheerful expression because you feel good. You just do it unconditionally. Let the light in your eyes be bright, peaceful and overflowing with love and confidence. Let it be the greatest light you can create. Control the light of your eyes with the power of your brain. You can create peace and love in your brain. Emit that peace and love with your whole face. Let your eyes shine with positive energy. Create a light in your eyes and an expression on your face so cheerful that it makes those around you wonder, why is that person so happy? Straighten your lower back and open your chest. Let all seven chakras open up and gush the energy of infinite life. Make your posture confident, bold and proud. Plant a beautiful dream in your brain. Create for yourself positive energy, making the light of your eyes gentle and peaceful. Create good news each and every day. Good news makes good brains. Live always in positive thinking. Positive thoughts create miracles. There is no hope in despair. There is no hope in conflict. Don’t choose despair or conflict, choose hope in every situation. Hope is a choice. Those who have hope and those who give hope are beautiful. Life is accompanied by much pain, but it shines in the moment you have hope. Hope does not make the suffering of life itself disappear, but suffering has meaning when we have hope. Great hope makes even suffering beautiful. I wanted to give a shout out for Change Your Energy’s first ever Energy Healing Summit. It is my great honor that I have been invited to speak there among 7 other AMAZING speakers, who I admire deeply, and who have helped me in my healing process over the last 18 years in so many ways. And to top it all off, the keynote speak will be my teacher, Ilchi Lee. How exciting! Each speaker will have wonderful wisdom to impart. I will be talking about what I usually talk about ~ managing emotions 🙂 Other things too, but that’s the gist. 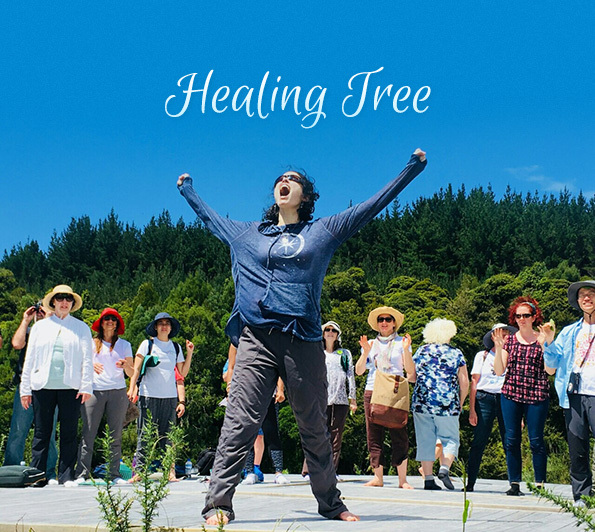 It will be a free week of healing messages and tips ~ I hope that you can join me there!